Two awesome Delta Force Paintball centres in Surrey! Delta Force Paintball Surrey offers two fantastic venues (South West London and Surrey paintball centres), conveniently located off Junction 10 of the M25 motorway in leafy Effingham. 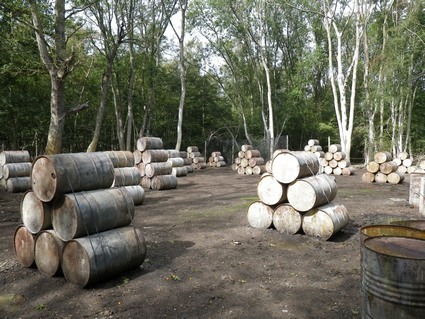 A gorgeous outdoor setting for the ultimate day of paintball! Delta Force South West London Paintball plays host to 7 outstanding game zones with movie themed scenarios to re-enact with your mates, including: Viet Cong Village where lots of angry villagers await you; the Zombies’ Crypt where you need to attack and take out the opposition and avoid the creepy zombies lurking behind tombstones and London Apocalypse which uses original bright red double decker buses for players to take shelter in. Other exciting paintball games zones include Chemical Alley, Mad Murphy’s Jungle Attack, The Berlin Wall and the menacing two-storey Castle Wallenberg. Our great selection of games at our South West London paintball centre means there’s something for everyone to enjoy. Located only a few yards up the road is our second paintball centre, Delta Force Paintball Surrey. You won’t miss the front entrance with a crashed Alvis Stalwart heavy-duty amphibious military truck stationed there! Other eye catching props include a crashed helicopter positioned on the top of basecamp. Its state of the art range of paintball game zones include: Tomb Raider featuring a large Egyptian stone pyramid with tunnels and statues and London Apocalypse which includes several red double decker buses for players to take shelter in. Paintball pyrotechnics are also available for adult players, such as paint grenades, smoke grenades and MK5 thunderflashes! These can be used as a clever diversion tactic or to shock and confuse the enemy! 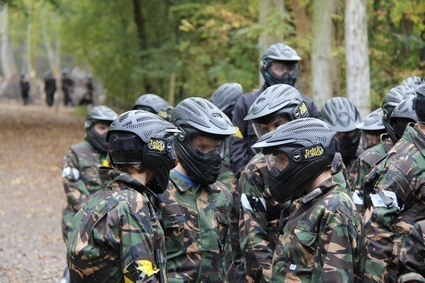 Our Surrey Paintball Centre also offers guests mini paintball games for children (aged 8 to 10). Our exciting and unique events use smaller, lighter paintball markers with smaller paintballs. This means that less energy is released when the paintballs hit players, creating a softer impact. As a result, these events are really popular for children’s birthday parties ! If you’d like to book a paintball activity for you and your friends or to request further information about Delta Force Paintball Surrey and the special packages we offer, call 0203 869 9301 and speak to one of our friendly members of staff.